Like most of us, I have a bucket list of baking recipes. Still a long way to go with versatile recipes and techniques like pie crusts, breads, foam cakes, real and rough puff pastry, Danish, phyllo, custards, meringues, pâte à choux to name a few. I may not fall madly in love with all of them, but if I can turn them out the way they are supposed to be, that will be satisfaction enough. I sometimes wish I could have had a chance to learn at a good culinary school. For now, the wealth of information on the internet is my guide, my little kitchen my school. I will stumble, I will fail, I will throw my hands up in despair, learn from my failures and bounce back sooner or later. Oh yes, succeed too at times. As they say, I am in no race. This is my journey and I have just myself to compete with. The little triumphs are a big high. If I am just a little better than yesterday, it still is progress. One little triumph I must chronicle - choux pastry! Something I had done once successfully before I started blogging - may be it was just my luck. Not so lucky the next attempt after years as I ended up with high rising puffs which deflated later. And then after a long choux pastry hiatus, the pastry Gods smile upon me. Yes, I made some not-bad-puffs! 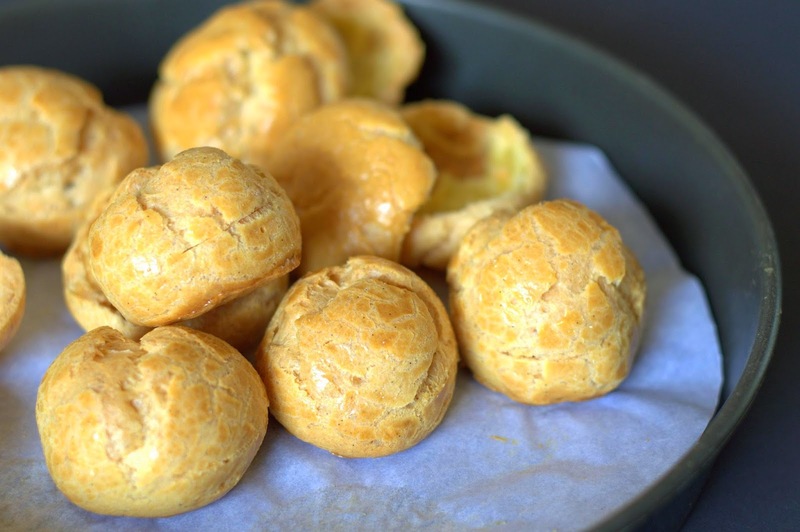 Choux pastry (pronounced shoo pastry) or pâte à choux is a French pastry which is first cooked on the stove top and then baked. The pastry puffs up in the oven creating a hollow inside and a crispy outer shell. 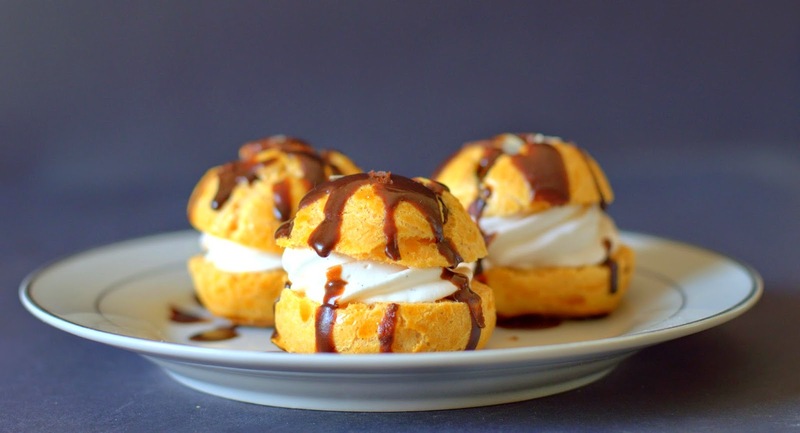 Its the base for desserts like cream puffs, éclairs, profiteroles, Paris Brest, Gateau Saint-Honore and Croqembouche. There could be savory fillings and savory puffs (called gougères) too! Of course most things are easy once you get the hang of it, this one sounds simple enough too. But then there are always the little details that make a difference. Here are a few pointers I gather about this pastry. 1. The dough is first mixed and dried out on the stove. The amount of evaporation of the liquid will affect the dough consistency and how much of egg you add to the pastry later. So, careful about the liquid evaporation. 2. The butter must melt before the liquid comes to a boil or you may end up evaporating more of it. So, having the butter soft and in pieces helps. 3. It is almost effortless to incorporate the egg into the mixture using a stand mixer*. If mixing by hand, it requires some muscle power to do a good job! 4. Most recipes specify you hold back some egg and add if needed. You can't really say how much of it you will need as it depends on the flour, the amount of water that evaporates when you boil it with butter, and probably also how much the pastry is dried out on the stove. 5. Pay special attention to the desired consistency of the dough when you add the egg. At the right consistency, its supposed to stay on the spatula and then fall in a thick ribbon. Watch the video for a better idea. 6. The pastry is first baked at a high temperature for it to puff up and then at a lower temperature to crisp up the shells, dry the insides. The interior may still have a moist (not wet) crumb which is fine. You could just pull out the moist insides, dry it out further if you want it more crisp. This is a matter of preference. 7. The tops cracking probably is alright I guess as I see the puffs of Stephanie and Micheal Roux too looking the same. The salt is supposed to help prevent cracking. 8. 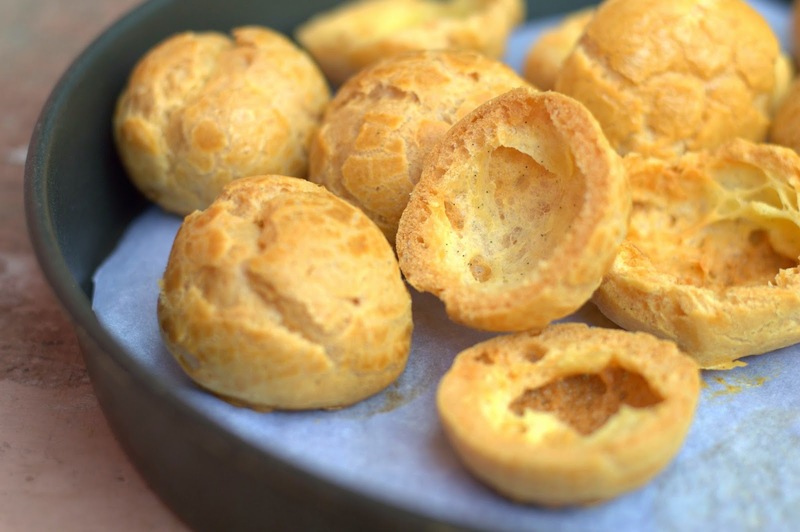 Finally, a properly baked choux pastry is one which is light, holds its shape when baked, has a dry and crisp exterior. Don't know if mine were light enough, but certainly held their shape and were crisp. So I think its not a bad start. But looks like I have dried them out a wee bit more - nothing that can't be remedied! You will need a spatula, a wooden spoon, a heavy saucepan, another medium sized bowl to beat the pastry in. A hand mixer or a stand mixer. Strong arms your pride? You could also beat by hand. Mise en place. Pre heat oven to 200 C / 400 F.
Keep the flour in a bowl near the stove. Take the butter, water, sugar, vanilla caviar and salt in the saucepan. Stir rapidly with the spatula till the mixture is smooth and starts coming away from the sides of the pan. Quickly, transfer it to the waiting bowl (or the bowl of the stand mixer* ). Let it cool for a few minutes till it is lukewarm. On speed 2, slowly start adding the whisked egg. Increase speed make sure the egg you have added is fully incorporated into the mixture before adding more egg. Keep adding the whisked egg, checking the dough for consistency when about 2 tablespoons of egg is left. (It will be a little thick, so the dough kept going into the blades, times I wish I had a stand mixer). Using the spatula, drop some of the mixture into the bowl. If it falls in a thick ribbon/ curtain, you are there (video again). If the dough doesn't drop or is very thick , add the remaining egg, beat again till fully incorporated. Check again. I had to add 96 grams plus a tablespoon more. If the dough kind of just flows down, you know you have added more egg than you need to. Bake at 200 C for 15 minutes. Lower the temperature to 180 C / 350 F and bake for a further 30-35 minutes. The pastry must be puffed, golden on top, dry and crisp. To test, bake 30 minutes, take one out of the oven (still on), break open. If the insides are wet, score the shells and bake for 5 minutes more. Its fine if the insides are moist. You must eat one when still warm! Buttery, eggy, I liked that! I have pulled out the moist insides and baked again for 5 minutes to really crisp them up. When cool, store them in an airtight container. You can freeze the baked puffs. Defrost the puffs and then reheat in a 350 degree F (177 degree C) oven for 5 to 10 minutes, or until crisp. 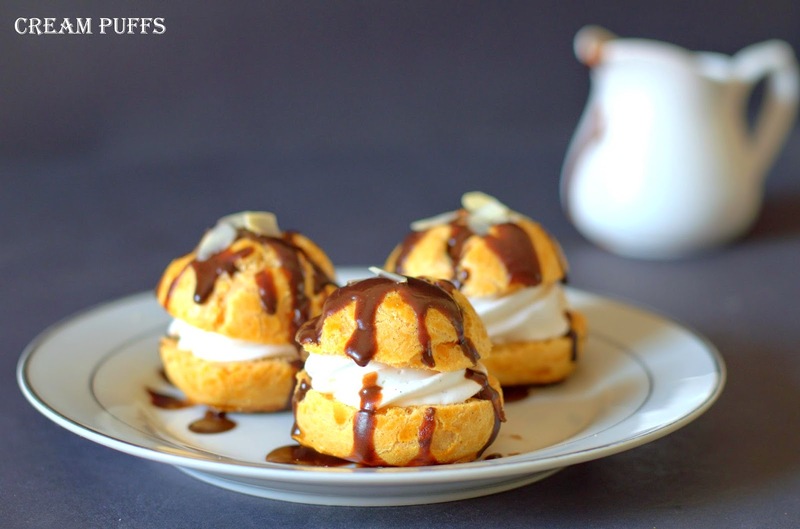 Cream puffs : Pipe some vanilla flavored sweetened whipped cream into the shells and drizzle over some chocolate glaze. Serve immediately. Alternatively you could fill and refrigerate them for some time for softer pastry. I think I liked them a little softer and warm. In some recipes, the eggs are added to the hot dough. Also read that you can pipe the dough and freeze it for later use. I am going to be trying more variations, more recipes of this. Just curious! 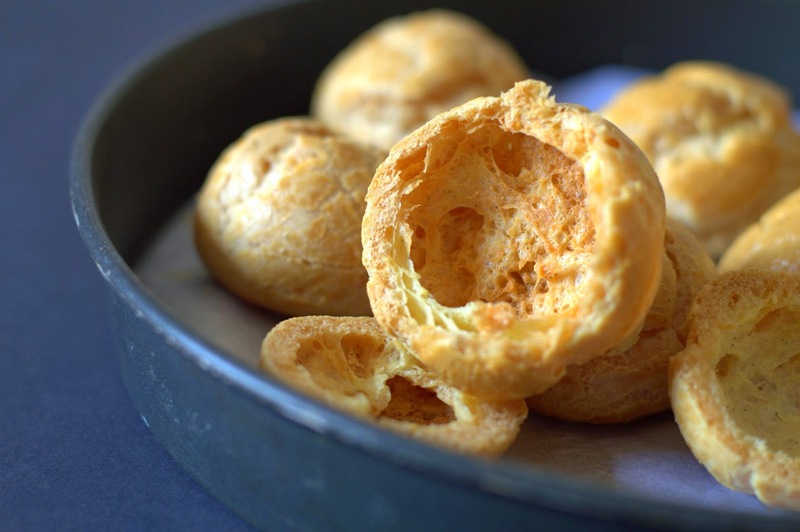 I want to try recipes of Michael Roux (those puffs look really light!) and Rose Levy Beranbaum too if Santa gifts me a food processor soon! More updates here as I learn my lessons with choux pastry. *DISCLAIMER: This post contains affiliate links. This means if you click on the link and buy through the link, I will earn a tiny commission on the same. I recommend products which I have used and found good or products I would consider for myself based on recommendations from my trusted baker friends. Oh dear, I love the way you have piped the cream into these puffs. They look so decadent!